If you read my weekly pregnancy updates you may have realised by now that I live in my maternity leggings. However, for about a month or so I have bought about 3 or 4 maternity jeans and jeggings and neither of them are comfortable. I find it really hard to get the right jeans to fit me and feel comfortable. I have big thighs and big hips, so I always struggle with sizes. I was recently sent some maternity jeans to try from Mamaway. Because of the price of the jeans, I was really interested too see if the jeans was worth the price, if they were the right fit and if they would be comfortable. I had got a size 18 and when they arrived I couldn't wait to try them on. The leg was a little long, but I prefer a long leg than it being shorter and it meant I could just fold the bottom to how I want it, so I was happy with them. As I put the jeans on, they went on perfectly until I reached my thighs where I thought they would get a bit too tight. But after putting them on properly and putting the bump band over my bump, the jeans were really comfortable. The soft and super stretchy maternity jeans are really comfortable to wear. 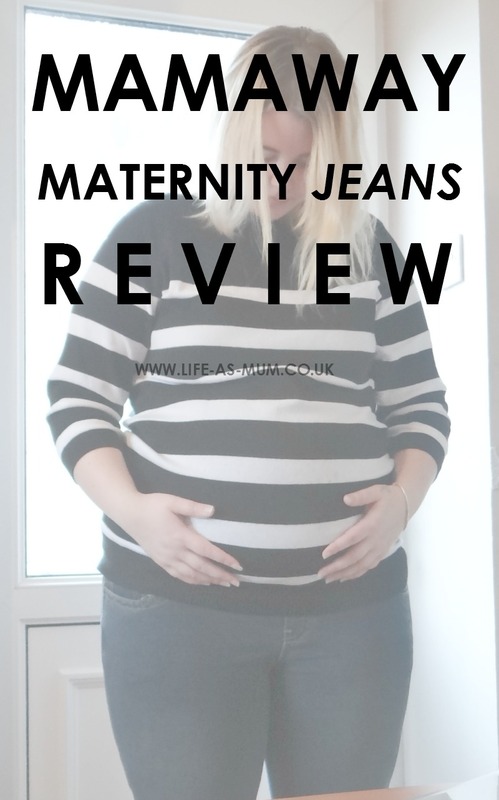 One of the most comfortable maternity jeans I have worn and I can see these jeans being one of my favourite bottoms to wear along with my maternity leggings. I have matched the jeans up with a stripped black and white maternity top from Bonprix. The over the bump band has a string which you can tighten or loosen as your bump grows. I feel so much better now that I have jeans to wear as my day wear. As with leggings you have to team them up with something quite long like a tunic or a dress. It feels nice to be able to wear normal sized tops with jeans and feel comfortable. If you are looking for some maternity jeans, I would recommend these soft super stretch maternity jeans from Mamaway. These look great I really struggled finding comfy jeans when I was pregnant they never seemed to fit in all the right places. They look super comfy! I never brought any maternity wear when I was pregnant (god knows how I got away with that one) but I did find it very un-comfy in normal size 6 jeans the whole time. Maybe next time I wont make the same mistake and ill be buying some jeans just like these! Ooh they look so comfortable but stylish too. Great to have jeans that are well fitting and comfy. I would have been all over a comfy pair of jeans like this when I was pregnant. They look great! They look great. I didn't actually get maternity jeans until the last few weeks and then wondered why I didn't get them earlier. These look comfy! This looks very comfy. Wish I had this while pregnant. Those look fab on you :) I remember my maternity jeans well, I wore them to death! Its important to be comfortable in pregnancy and these jeans look the perfect fit.